Lonnie Smith – You Do Hoodoo? 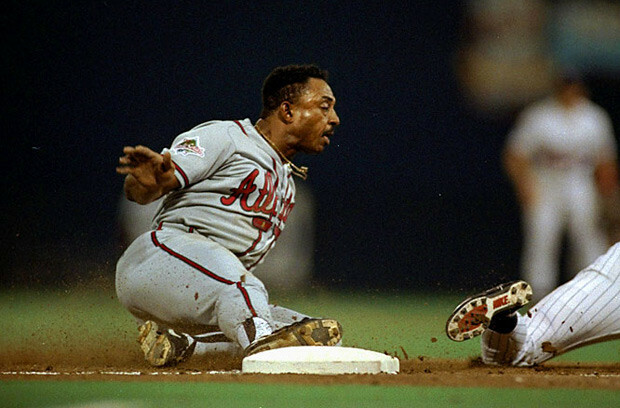 Alas, Lonnie sliding into second in Game 7 of the ’91 Series when he had a clear path home in a 0-0 tie. Another ditty courtesy of my major muse, Insomnia, who brings us those dark hours when ghosts— in this case Lonnie Smith of the 1991 Atlanta Braves — crawl out of their shallow graves to grieve us. the barking of that distant dog. just the whisper of insistent desperate yipping. Lonnie Smith failed to round third and score? like the lid of a laptop. Too bad Lonnie got deked. Too bad that was then and now is now.